The 2015 Winter Series shall be only two months, using a 50′ x 50′ working space. Refer to the League Rules. The November game course map, scoring worksheet and current rosters has been sent out to existing franchise clubs on October 2. Any new club interested in joining play can download the scorekeeping (Excel) worksheet: November scorekeeping worksheet. If you have any questions, contact the: League Secretary. 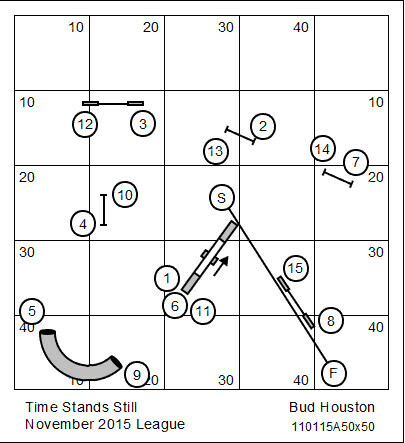 This is a game originally designed as a training protocol, specifically to teach and proof a 2-on/2-off contact performance. The training game has been elevated to a gritty game of competition. Ostensibly this is a simple follow-the-numbers game. However, the game has special rules for timing. When the teeter has tipped (and is touching the floor) the time will stop. Once the dog leaves the ramp time will begin again. Note that initially time begins when the dog first dismounts the teeter. The MVP dog is Kasey, a Border Collie handled by Laurie Bowen. Kasey scored 375 Lifetime Performance points, outscoring all other dogs in the league. Kasey plays for Sit, Stay, ‘N Play in Stroudsburg, PA.
You can view the Top 100 dogs in the Fall 2015 Series: HERE. 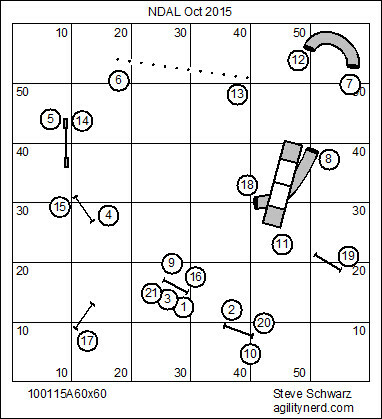 Click to download the November scorekeeping worksheet.